KLCI Is Consolidating Above The Lower Bollinger Band. Share prices on Bursa Malaysia ended lower as profit taking emerged as global markets slipped further as concerns mounted over the Middle East turmoil. At close, the FBM KLCI down 2.96 points or 0.2% to 1,499.28. Market breadth remain negative with decliners outnumbered advances 796 to 117 as unrest in Middle East and North Africa may continue to dampen investor sentiment and result a further weakness in the near term. Surging oil prices above US$100 continued to weigh on investor sentiment and could result in more wild swings in the near term. 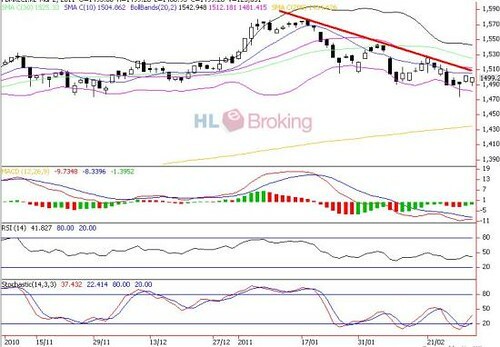 Despite external shocks, the ability of KLCI to consolidate above the lower Bollinger band coupled with improving slow stochastic and MACD histogram readings are positive signals for a technical bounce. However, as local investors are still erring on the side of caution with dwindling volume, the mid Bollinger band (1512) is going to act as an immediate resistance, followed by 1525 pts (50% FR from all time high of 1577 and 1474). Meanwhile, support levels are situated around 1481, 1474 (3M low) and 1450.